Lee Thompson Young (February 1, 1984 – August 19, 2013) was an American actor. He is best remembered for his adolescent role as the title character on the Disney Channel television series The Famous Jett Jackson (1998–2001) and as Chris Comer in the movie Friday Night Lights (2004). His last starring role was as Boston police detective Barry Frost on the TNT police drama series Rizzoli & Isles (2010–14). Young was born in Columbia, South Carolina, the son of Velma Elaine (née Love) and Tommy Scott Young. He was in the second grade when his parents' marriage ended, and he went to live with his mother. At age ten, he portrayed Martin Luther King in a play called A Night of Stars and Dreams by Dwight Woods, and the Phillis Wheatley Repertory Theater of Greenville, South Carolina. It was then that Young decided he wanted to become an actor. Young moved to New York City in June 1996, but it was not until the next year that he auditioned for the part of Jett Jackson in The Famous Jett Jackson. He filmed the pilot and found out in June 1998 from the Disney Channel that the show had been picked up; it later went on to become a Disney Channel Original Movie in June 2001. Young also starred in Johnny Tsunami (1999), another Disney Channel Original Movie, as Sam Sterling. The movie was successful, but he did not reprise the role in the sequel, Johnny Kapahala: Back on Board (2007). After the cancellation of The Famous Jett Jackson, Young had guest spots in the CBS series The Guardian. He also had a part in the movie Friday Night Lights (2004), portraying Chris Comer, and a part in the Jamie Foxx movie Redemption: The Stan Tookie Williams Story (2004). Lee appeared on UPN's TV drama series South Beach, and he portrayed Victor Stone (known in DC Comics as Cyborg) in a fifth-season episode of the television series Smallville, in 2006; which character he reprised in the Season Six episode "Justice" (airdate January 18, 2007), and again in the Season Nine finale "Salvation" (airdate May 14, 2010). Young appeared in the feature film Akeelah and the Bee (2006), playing Akeelah's brother Devon. He played National Guard rookie, Delmar, in The Hills Have Eyes 2 (2007). In 2009, Young played a cocky surgical intern in the hit comedy show Scrubs. It is revealed that his character was an overweight child. The character becomes involved in a romance with one of the medical interns. Young played the role of Al Gough, an FBI agent, in the ABC television drama FlashForward. He was written off the show in episode 7, when his character committed suicide to prevent the death of an innocent civilian. His last acting role was playing Barry Frost, partner of Jane Rizzoli (Angie Harmon) on the TNT drama Rizzoli & Isles, and he made an appearance on the Fox drama The Good Guys as the brother and business partner of an arms dealer. Young graduated with Honors from the University of Southern California, where he majored in Cinematic Arts and was a member of the Kappa Alpha Psi fraternity. Young enjoyed writing and wrote the screenplay for the 2007 short film Mano. On August 19, 2013, Young failed to show up for filming an episode of Rizzoli & Isles. Police were called to do a well-being check on him at his Los Angeles apartment, where he was found dead. His manager stated the actor had committed suicide. Police confirmed the cause of death as a self-inflicted gunshot wound. Young had been diagnosed with bipolar disorder, for which he had been taking medication, and had been suffering from depression before his death. After funeral services at Inglewood Park Cemetery, Young was interred at Lakeview Memorial Garden, York, South Carolina. A three-hour memorial service was held on the Paramount Studios lot. Young's family launched the Lee Thompson Young Foundation in an effort to help remove the stigma surrounding mental illness. 2002 Philly Steven Hicks Episode: "There's No Business Like No Business"
2003 Jake 2.0 Prince Malik Namir Episode: "The Prince and the Revolution"
2003 The Jersey Himself Episode: "Origins: Part 2"
2004 The Proud Family Teen Bebe (voice) Episode: "Twins to Tweens"
2005 Kevin Hill Levi Episode: "Homeland Insecurity"
2008 Terminator: The Sarah Connor Chronicles Agent Stewart Episode: "Heavy Metal"
2009 Lincoln Heights Julian Episode: "Bully for You"
2010 The Good Guys Eric Williams Episode: "Small Rooms"
2012 CSI: NY Kelvin Moore Episode: "Unwrapped"
^ a b Holleman, Joey (August 19, 2013). "Columbia native turned TV star takes own life". The State. Archived from the original on October 23, 2013. Retrieved June 15, 2014. ^ "Lee Thompson Young Biography (1984-)". Film Reference. Advameg, Inc. Retrieved June 15, 2014. 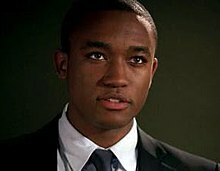 ^ "Lee Thompson Young: Brilliant young actor and a gentle soul". The Sydney Morning Herald. August 20, 2013. Retrieved June 15, 2014. ^ "''Mano'' (2008), a film by Brad Tiemann". Cinema.theiapolis.com. Retrieved August 25, 2013. ^ Elber, Lynn (August 19, 2013). "Actor Lee Thompson Young found dead at age 29". The Las Vegas Sun. ^ "Lee Thompson Young Ex-Disney Superstar Dead". TMZ. Retrieved August 19, 2013. ^ Freydkin, Donna (August 19, 2013). "Lee Thompson Young found dead". USA Today. Gannett Company. Retrieved August 19, 2013. ^ Woo, Kelly (August 19, 2013). "Former Disney Channel Star Lee Thompson Young Found Dead". Yahoo!. Retrieved August 20, 2013. ^ Nancy Dillon (October 8, 2013). "Lee Thompson Young suffered from bipolar disorder before suicide: coroner's report". The New York Daily News. ^ Johnson, Zach (September 4, 2013). "Lee Thompson Young's Death Certificate Released, Suicide Confirmed". E!. ^ "Angie Harmon in Tears at Lee Thompson Young Memorial". ^ "Family breaks silence on actor Lee Thompson Young's suicide". wistv.com. Franklin Media and WISTV. Retrieved February 3, 2016.